The Canadian men won the Singapore tournament in 2017, their lone victory on the World Series. But a tough draw following a poor showing in Hong Kong last week had them facing two of the top four teams on the circuit in pool play. Canada, 12th in the overall standings, was outmatched in losing 50-12 to No. 2 Fiji and 36-0 to No. 4 South Africa. The day finished on a more positive note with a 33-10 win over No. 10 Scotland. Fiji was upset 19-12 by Scotland and beaten 17-7 by South Africa. The Blitzboks (3-0-0) won Pool A with Fiji, Scotland and Canada all showing 1-2-0 records. Fiji finished second on points difference with Canada fourth after its two lopsided losses. Canada will now face No. 14 Japan in the consolation Challenge trophy quarter-finals. New Zealand, the U.S., and Australia joined South Africa in winning all three of their pool matches. The Cup quarter-finals are South Africa versus Samoa, the U.S. versus Argentina, New Zealand versus Fiji and Australia versus England. The Americans arrived in Singapore atop the overall standings with 130 points, Fiji was second (123) ahead of New Zealand (118), South Africa (99) and England (90). The top four teams at the end of the 10-event season secure automatic qualification to the 2020 Olympics. Mike Fuailefau and Justin Douglas led the Canadians out against Fiji, in honour of their 50th tournaments. Canada beat Fiji 26-19 the last time they met in March in Vancouver. But Saturday's result improved Fiji's lead in the head-to-head meetings to 48-5. Fiji was coming off winning the Hong Kong event for the fifth year in a row while Canada tied for 15th in what Damian McGrath, in a social media posting, called "without doubt the worst tournament we’ve played since I began coaching Canada 7s." Canada started well against defending champion Fiji, retaining the ball after kicking off. But after several waves of attack, it lost the ball at the breakdown and Fiji captain Paula Dranisinukula scored after taking a pass from Jerry Tuwai, who clutched his hamstring after going down. 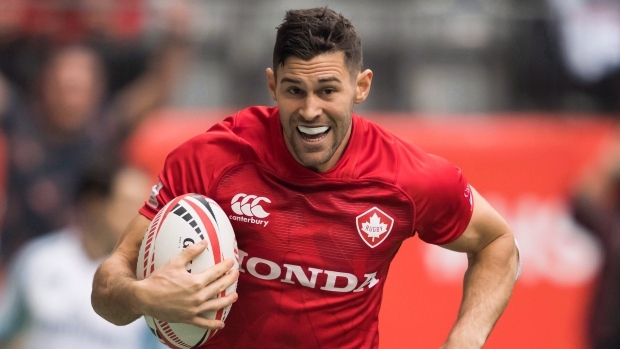 Canada answered quickly with Matt Mullins slicing through the Fiji defence for a try to tie it 7-7. Helped by a Canadian penalty at the breakdown, Fiji moved ahead on a Meli Derenalagi try set up by several offloads in attack. Sevuloni Mocenacagi added to the lead, beating several Canadian defenders after a Fiji scrum that followed more good work at the breakdown. Fiji led 19-7 at the break. "Nobody said it was going to be easy," Fiji coach Gareth Baber told his players. "They're a good side." But it was easy in the second half. Aminiasi Tuimaba added to the Fiji lead early in the half, the recipient of a glorious offload from Vilimoni Botitu while sandwiched between two Canadian tacklers. That increased the lead to 26-7. Fiji kept the scoreboard turning with tries by Tuimaba, Josua Vakurunabili, who intercepted a Canadian pass and strolled under the posts, and Apenisa Cakaubalavu. Harry Jones scored a consolation try in the final seconds, ending Fiji's string of six tries. But off the ensuing kickoff with no time remaining, Cakaubalavu scored to add to the Canadian pain. Canada finally got a break when the Fiji conversion attempt rattled off the post. It was not Fiji's highest score against Canada. The Pacific Islanders won 63-14 in Dubai in 2015. Mullins, Jones, Nathan Hirayama, Phil Berna and Jake Thiel scored tries in the win over Scotland after the shutout by South Africa.